Wondering where to hang out in Central Mumbai, with family or friends? Confused about what to do and where to eat in and around Shivaji Park? Check out this article for more information about tourist attractions in Shivaji Park and make your evening a memorable one! In case you are in Central or South Mumbai and want to catch up with friends or have an evening out with family, here is a wonderful place for you. It is right here in Central Mumbai: Shivaji Park. Did you know that Sachin Tendulkar started playing cricket in this very place? Many stalwarts stay around the park. I thought of writing this article so that you may get interested in visiting this place for an evening out. Come and enjoy your evening at this place with friends or family. Do not forget to get the people who visit you from out station. I am sure they will take back cherishable memories with them when they return to their hometown. First a little bit about the history of the park! It was created in 1925 by the Bombay Municipal Corporation, during the British Rule. The Dadar Hindu Gymkhana opened its first Tennis Court in the then called Mahim Park in 1927 and was soon named as Shivaji Park. During the British period, this park was a common venue for meetings of freedom fighters and post-Independence for consolidated Maharashtra. Even till date, Shivaji Park is a well-known venue for political gatherings of Shiv Sena. Near the Arabian Sea, the park is surrounded by buildings built way back in the 1900s and the residences of famous personalities from literature, theatre, commerce, and sports. The Shivaji Park is the largest park in the island city of Mumbai and has its own historical importance. It is spread across 28 acres of ground and has open spaces for sports while the boundaries of the ground are occupied by about 31 tenants. These include clubs like the Shivaji Park Gymkhana, Bengal Club, Samarth Vyayam Mandir (gymnasium), Shivaji Park Nagarik Sangh (established in 1947), a children's Park, Nana-Nani Park ( park for senior citizens), Scout's Pavilion, a Ganesh temple and a library. The walkway is lined with huge rain trees. This place is reachable from South, Western, Central, and Harbour areas. Buses from all parts of Mumbai stop at Shivaji Park. Dadar Western, Dadar Central, and Wadala are quite near the park. Hence, this place becomes reachable from various corners of Mumbai. 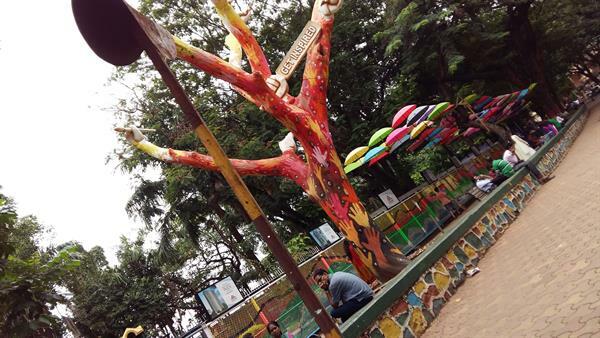 What you can do at Shivaji Park? Well, ample of things to do: sit on the parapet, walk around, eat, play etc. 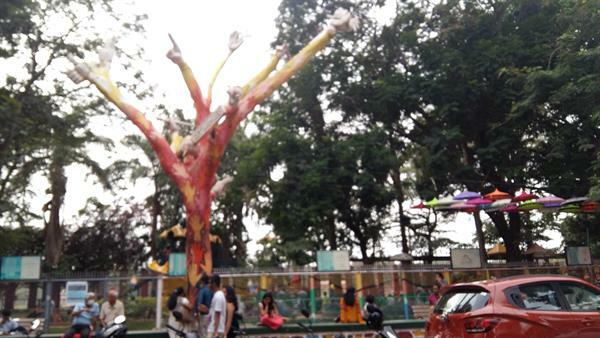 This place is suitable for all ages and hence it is always crowded in the evenings and especially more on weekends. Shivaji Park Ground: Called SP maidan, in short, is renowned as the cradle of Indian cricket. It is home to eight cricket clubs including that of late Anna Vaidya and Ramakant Acharekar who have produced several international cricketers like Sachin Tendulkar, Sunil Gavaskar, Ajit Wadekar, and much more. Cricket may be the reason Shivaji Park is famous for, but few of the city's budding talent also practice their football here including teams like Adarsh FC, Dadar XI, Dias united Sports Club, Kenkre, BEARS FC, VAKYPPS FC, etc. Bust of Meenatai Thackeray: One of the main entrances to the park is on the east side, intended for pedestrians. You can see the bust of Meenatai Thackeray, late wife of Shiv Sena leader Balasaheb Thackeray at this entrance. Statue of Shivaji Maharaj: Bang opposite on the west side of the park you can check out the statue of Shivaji Maharaj leading the way with an outstretched arm. For information, the state was set up with donations from the local population way back in 1966. Swatantray Veer Savarkar Smarak: Opposite the Shivaji Park statue, you can enjoy a visit to Sawarkar Smarak. The place also schedules a Light and Sound Show, daily in the evenings. It also houses coaching for competitive exams, rifle shooting range, sports academy. Mayor's bungalow: it is right on the breach and you are allowed visit it once a year on Holi. Swimming pool: A total of five swimming pools, suitable for Olympics. Ambedkar Smarak: Located on the beach and flocked by Dalits in the week of 6th December every year. Shivaji Park beach: suitable for a short walk, and an ideal place to watch the Bandra-Worli Sea Link with Bandra Bandstand on the right and Worli village on the left. Best time to see is dusk, you will get both views: evening and night. Shivaji Park ground: The ground is surrounded by a small parapet called the Kutta, and cement benches, a common hangout for all: teenagers, young and the old. People walk, jog or run along the paved path along the inner circumference, measuring about 1.17 km. Children's park: with lovely setups for small children. It is filled with children's laughter, squeals daily in the evenings. Just outside the garden is a dried tree, painted in awesome colors, and about 50-60 colorful umbrellas just under the tree. This is a selfie point. Crossword Corner: It is a bookstore where you can browse books at your heart's content or enjoy reading the book in the reading lounge. Udyan Ganesh Mandir: regularly visited by the bhakts, and lighted up on special festivals. Shivaji Park is a foodie's paradise. You can relish Shegaon Kachori, Maharashtrian food at Aswad or Gypsy-thalipeeth, missal pav, sabudanavada ,vadapav, Tibbs Frankie, Rolls, Ice gola, Chinese- Gypsy ,Bhel- sevpuri,Panipuri, MoD, CCD, Barista etc. If the weather is hot or just cool, then try out Ice cream at Naturals, Gelato, Baskin Robbins, Dairy Don. If you want to hangout with friends then try out CCD, Lavassa. You can enjoy salted peanuts or chana chanachor gram. If you have a headache, then get a head massage on the park parapet. Lunch/ dinner places include Nebula, Masala Zone, Aaswad, Gypsy Chinese, Prakash, Ovenfresh, Sujata, Open house, Home Chef and much more. Lastly, a few renowned personalities residing in Shivaji Park are Manohar Joshi, Ex-Chief Minister of Maharashtra, Raj Thakarey, Maharashtra Navnirman Sena supremo, Milind Soman- model and actor, Anup Jalota- bhajan singer, dada Kondke- film producer, Sandeep Patil and Ajit Wadekar- cricketers. You never know , consider yourself lucky if you come across any of them while in the park. 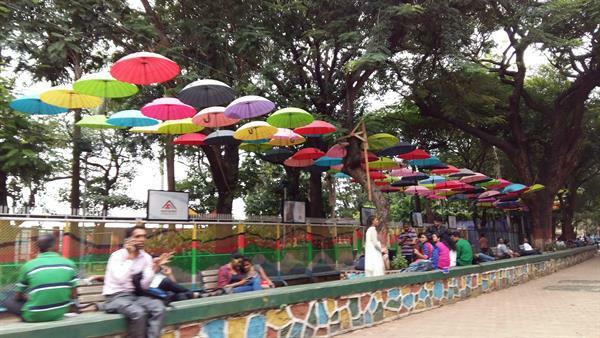 In short Shivaji Park is one of the most convenient and comfortable hangouts for spending time with friends or family. Shivaji park is one of the popular public parks in here. Peoples came here for walking and playing. It's a good place for walking and also to spend time with your family and friends.